"Remember when experience mattered? Thanks to this book, no matter how new to your field or how young or inexperienced you are, you can learn from people who have actually done it. "Having recently launched my fourth startup, I can say without reservation that what Brad and David are doing to promote entrepreneurialism is accelerating the pace of innovation. 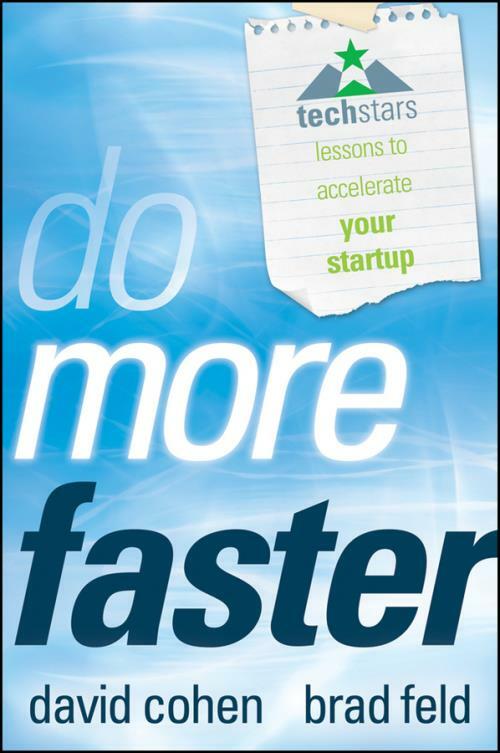 Additionally, the ideas and examples they reveal in Do More Faster are tangible and valuable lessons for anyone thinking about starting a new business. Their passion, vision, and commitment to the startup community, both through TechStars and their personal mentorship, are unmatched." Pete Sheinbaum, founder and CEO, The Mandelbrot Project, Inc., and former CEO, DailyCandy, Inc.
"One thing is sure in the tech world: that history repeats itself. The lessons in founding companies are always the same, yet these are rarely passed down from one generation of entrepreneur to the next. Brad and David have done a brilliant job of crystallizing the most important lessons and bringing them to life in the words of the entrepreneurs. Every startup founder should read this book!" "Do More Faster is a locked–room all–nighter with David Cohen, Brad Feld, and the impressive mentors to TechStars; it is candid, smart, and spot–on. This is some of the very best advice entrepreneurs can get anywhere. Buy it already." Theme 1: Idea and Vision. Trust Me, Your Idea IsWorthless. Find That One Thing They Love. You Never Need Another Original Idea. Pull the PlugWhen You KnowIt′s Time. If You Can Quit, You Should. Two Strikes and You Are Out. Use Your Head, then Trust Your Gut. Be Tiny Until You Shouldn′t Be. Have a Bias Toward Action. Don′ t Wait Until You Are Proud of Your Product. You Don t Have to Raise Money. There′s More than OneWay to Raise Money. Beware of Angel InvestorsWho Aren′t. Seed Investors Care about Three Things. If YouWant Money, Ask for Advice. Turn the Knife after You Stick It in. Don t Overoptimize on Valuations. Get Help with Your Term Sheet. Focus on the First One–Third. Theme 6: Legal and Structure. Choose the Right Company Structure. Lawyers Don′t Have to Be Expensive. Vesting Is Good for You. Your Brother–in–Law Is Probably Not the Right Corporate Lawyer. To 83(b) or Not to 83(b), There Is No Question. Theme 7: Work Life Balance. What Motivated Me to Start TechStars? Why TechStars Started in Boulder. How TechStars Came to Boston. How TechStars Came to Seattle. So YouWant to Start TechStars in Your City?